Sad Yoyo loach, red mouth, gaping? Hi all! I'm hoping you can help me with a snap diagnosis on a sad yoyo loach. I noticed one of my yoyo loaches lolling at the bottom looking very unhappy as I was doing the rounds feeding my tanks today. His colour was darker than normal and he seemed to have something wedged in his mouth and his mouth area looked blood red. I got a net to catch him for a closer look but by the time I caught him, the apparent blockage was no longer visible. He is breathing heavily, lethargic, and seeking cover while his five yoyo tankmates are looping around searching for food and being very normal. I don't know if he ever did have anything in his mouth as I was not able to see properly until I netted him. After examination I let him go and he went back to laying on the bottom and half-heartedly hiding. I am not sure if he is gaping his mouth open because I'm new to keeping loaches and it's hard to compare him to the others. They seem to swim around with their mouths open too just in case any food goes in. There are malaysian trumpet snails in the tank and that is the hardest/sharpest thing I can think of that could have gone in his mouth and injured him. I am not sure if they could injure each other if they fought (but I have never seen these yoyos fight). I am a little concerned about bacterial infections so I am not sure if there is swelling or white material around his mouth either. 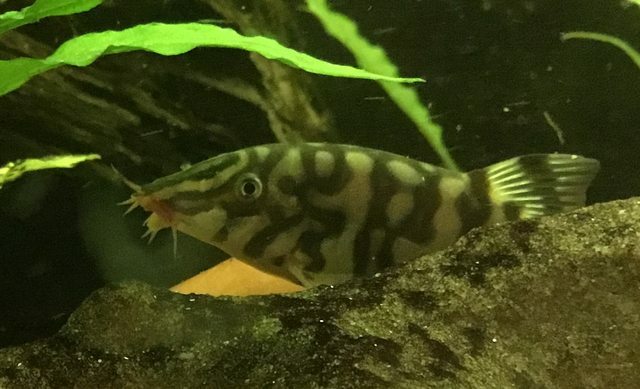 Anyway I was hoping someone with a bit more experience or a better eye for what a loach's mouth is supposed to look like could tell me if this looks like a simple injury or something more sinister. Tank: 4 foot long, stocked with 8 penguin tetras, 15 peacock gudgeons and 6 yoyo loaches. The tank has been running for a year and I have had the yoyo loaches for 6 months. They are still growing and are almost too big to hide in the ceramic tubes that are in the tank, so about a week ago I added some PVC tubes which give them a bit more room if they want cover. They rarely go to cover, even when sleeping, as they are the largest, most active fish in the tank. Parameters are 24ºC, hardness soft to medium - regular water changes etc. Every other fish in the tank is acting normally. The substrate is rounded gravel on top of sand (used to be a region of gravel and a region of sand until the loaches mixed everything up evenly), they get a combination of foods ranging from live grindal worms, vege flakes, sinking tablets, and of course snails, mostly ramshorn snails. The trumpet snails in the tank were there to stir the substrate and were in the tank before I got yoyo loaches. And some pictures - they don't show the red very well but in first and last pic you can see red at the edge of the lip, and in the second and third, the red inside his mouth. 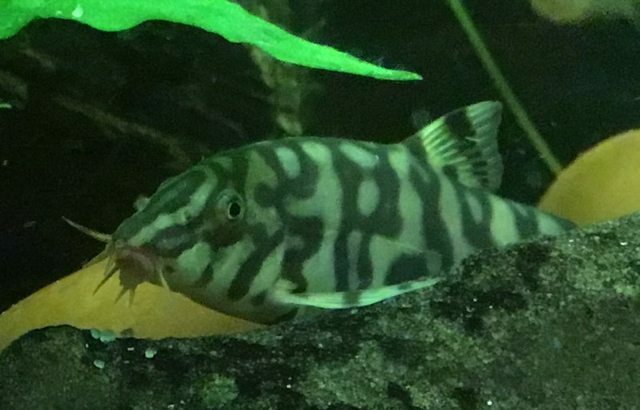 Re: Sad Yoyo loach, red mouth, gaping? An update on Sad Yoyo, his mouth still seems to have a little bit of a red lining and he is definitely moping and hiding. I have seen him half heartedly eat and he seems to be wary of other fish (but less wary of me than of the other fish, strangely). I think he might have been in a fight or just hurt himself and is feeling sorry for himself. I don't think his condition is worsening and I can't really see anything that looks like infection. I think I saw one of the other loaches make a move towards him and he shied away. So perhaps he is just the bottom of their pecking order and is having a bad stretch. I will continue to monitor and update if anything interesting happens. At this stage I have nothing notable to add apart from he is the easiest of my loaches to pick out, on one side his "YOYO" has become H H and on the other another h is visible so I have named him Triple H. I've noticed I have a VOVO and a YIYI now too, as well as 2 that are still fairly indistinguishable as their YOYOs have stayed fairly consistent. The last loach is starting to develop more intricate blobby network markings. I wondered how their markings would develop and trying to spot Triple H to see if he is doing okay has given me the opportunity to really work out which one is which. When I fed the yoyos today all six were out and about and begging for food. I have been feeding small or soft food so that the one with a sore mouth can still eat, and this seems to be working. 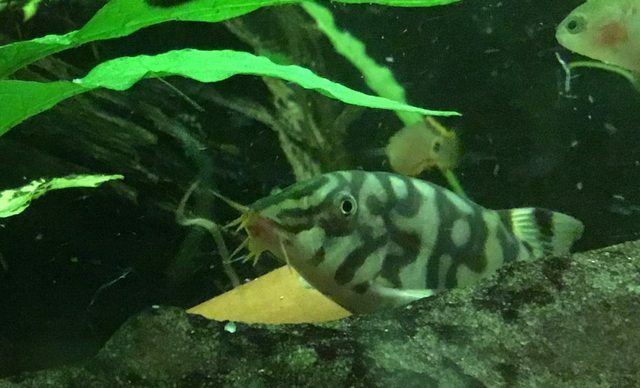 He is still hiding a bit (after the food was gone) and seems to be hanging around near the filter, perched among some anubias there. But he's eating and he swims normally some of the time so I think he is on the mend. Also I did some more reading and I think the red border on his mouth indicates that he's male rather than being some skin issue. I have been monitoring this fish and the redness no longer appeared visible around his mouth so I thought he was improving. However he hides or rests constantly, and his mouth doesn't look right at all. I don't think he has cotton mouth but I am seeing more white than I should. Barbels seem to be intact but either his mouth bits are protruding or somehow coated, or the skin around his lips has eroded away. 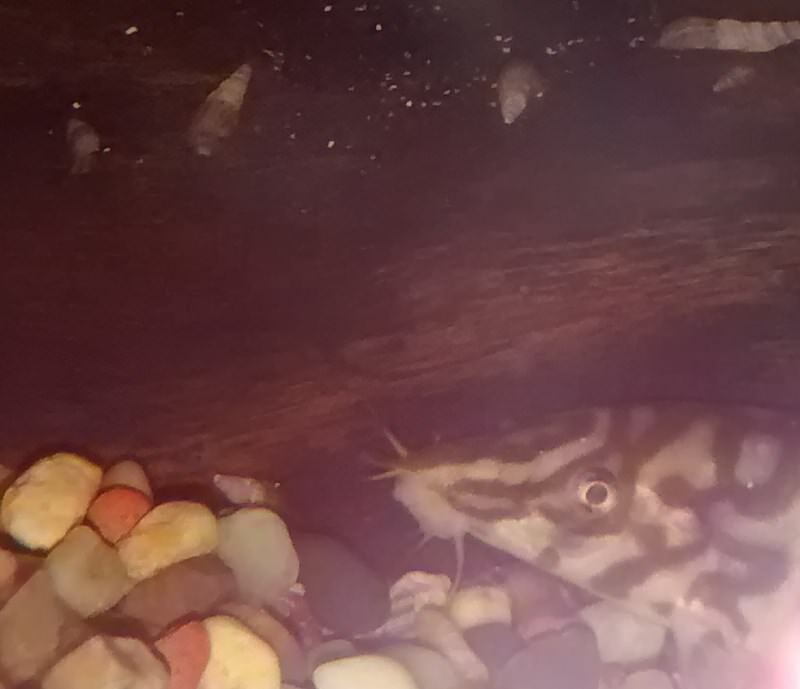 It doesn't look fuzzy like fungus but it's pretty hard to tell due to how reclusive this loach is being, and how complicated looking loach mouths are when you aren't used to them. I'm thinking of feeding some medicated food to this loach and hoping its not too late, I have some kanaplex which has instructions for soaking food. I'm not sure how to ensure this loach actually gets to eat the food. He does seem to want to eat but I'm not sure how successful he's been at it - if he can't eat, his lethargy makes sense. Normally I would try to remove to a hospital tank so the fish doesn't have competition but I already have 2 quarantine tanks on the go, so I might have to resort to a plastic tub. My options for dried food to soak the medicine in are: dried brine shrimp, dried tubifex and dried blackworm. Any ideas as to which one would work better? I don't have the seachem product that makes the medication bind to the food but maybe I could use a bit of repashy gel powder to make everything stick? Managed to sneak up on him in the dark and get a picture of his mouth. I have found the fish seem to prefer brine shrimp of the 3 you mention. They will eat live (moving) anything, but if it is dried it needs to have flavor or scent. (yes, fish can smell the food). Anything that will dampen the food can help the medicine to stick, but I am not sure that all moisture sources will hold the medicine to the food when you drop it in the water. Incorporating the medicine in a wet food (repashy or home made foods) might be the way to go. Mix it right in when the food is cool, but still liquid or near liquid, then serve the food when it gels or sets well enough to hold together. However, another option is to add 'Garlic Guard', a liquid flavoring for the food, adds some garlic flavor, which many fish seem to love. How fish developed a taste for garlic I have no idea- garlic does not grow in or near the water. A drop or two on dry food (flakes, pellets) can help the fish decide they like that food. A bit more Garlic Guard might help the medicine stick to dry food, but as I noted above, it might float right off again when you drop it in the water. If you dampen some flakes, mix medicine with that, then blend well (mashing the flakes) this should hold the medicine better. The instructions said 1 flat scoop of kanaplex per tablespoon of "food paste". So I measured a tablespoon of plain water, and crumbled in dried brine shrimp until it formed a wet paste. Then I mixed in the kanaplex and used a few pinches of repashy powder as a binder. The repashy powder contains garlic so I was hoping this would be attractant enough, and the brine shrimp itself smells pretty good too (reminds me of chicken stock cubes!). According to some googling I did, kanamycin is one of the few temperature stable antibiotics and still has 95% effacity after being autoclaved for an hour (!!) so I figured a bit of heat to set the repashy wouldn't hurt. The resulting paste has set into like a green brineshrimp hash brown and there will be enough for quite a few serves of this medicated food. I haven't had a chance to prepare a hospital tub to isolate this loach to ensure he has good access to the food but I dropped a small piece in to the main tank for a taste test and it seems to be readily accepted by the loaches. Fingers crossed I can get some into the sick loach and it will do him some good! Good that you did some research about how stable the medicine is when it is exposed to some warmth. I do not know if any of the other fish have a severe enough case of whatever this is to show symptoms, but they definitely have been exposed. If you start offering the whole tank some antibiotics, then finish the course for the whole tank. A partial dose will simply kill off the easiest to kill bacteria, leaving the stronger organisms to reproduce. Good idea, I will survey all the fish to see if anyone else is showing signs. I had been thinking this has happened due to the initial injury to the yoyos mouth but worth a look to see if it's something else. I'm usually off a mind that tanks are full of bacteria of all sorts and keeping the tank fairly clean and the fish stress free is usually enough to fend off the worst but I don't have to much experience with dealing with an active infection. I guess he would be shedding more bacteria than would normally be found in the tank. The other inhabitants are top dwelling tetras and low-mid dwelling peacock gudgeons. I've seen nothing obvious previously but that was casual observation not a proper amount of scrutiny. As many bacteria as there normally are in the tank, healthy fish generally can deal with them. When something happens to weaken a fish and the bacteria grow in population (such as an injury) this does indeed suggest the possibility that other fish can be affected. Extra water changes that emphasize vacuuming the floor of the tank, and inside caves and anywhere else there is poor water movement, and cleaning the filter are good ways to reduce the population of bacteria that could infect the fish. Generally, bacteria arte the result of biological stuff in the water. If your fishes are sensitive, it cold help to reduce the amount of wood in a tank. Wood decays resulting in both loss of oxygen and increased amounts of bacteria. Without wood, these problems are slimmer. Thought it was worth updating as to what is going on. I've been keeping a close eye on the main tank and have seen nothing wrong with any of the remaining fish. I took Bas' advice and moved some of the wood around, vacuumed underneath it and it didn't seem like there was as much broken down wood in the gravel as there used to be (just occured to me this is probably because the snails aren't constantly munching on the wood any more because there are now loaches constantly munching on the snails). In any case, I rearranged things to ensure better flow through the tank towards the filter intake and it will be easier to vacuum more thoroughly in future. The yoyo in the hospital tub would NOT eat the medicated food that I made. But it was pretty easy to medicate the tub with the kanaplex I had, which says it absorbs through skin/gills anyway. For a few days he didnt eat anything at all and I was removing the uneaten food. He continually hid under the fake plastic log that I'd put in there for him. I did the full course of kanaplex as recommended and had netted him out a few times to look at him, didn't see any notable deterioration of his mouth or further evidence of disease processes. At the end of the course of treatment, I happened to be in the room doing a water change on a different tank and noticed the hospitalised loach zooming back and forth at the side of the tub, apparently reacting to me being nearby. Took the lid off and saw he'd actually eaten his food for a change, so I decided to move him back to the main tank so I could better see how he was. Straight away he zoomed over to the other loaches and started swimming around with them, and I've seen him eat from the surface along side them now too. His demeanour is very much improved although either he's a runt or he lost a lot of condition for the few days he wasn't eating because he now seems much slimmer, shorter and overall smaller than the others. Honestly he might have been smaller all along and I just hadn't noticed. I have seen one of the other loaches kind of push at him which made him swim away, but he has been swimming in a group with 2 other loaches who don't seem to mind him. I do think he might have been picked on a bit in the first place but with the way I've rearranged the tank and the extra PVC pipe I've added there is less need to squabble over places to sleep. Anyway I don't think he much liked being in a tub by himself, he seemed genuinely happy to see other fish again. Watching him eat, he does still seem to struggle a little bit but at least is interested in food again which is a good start. For now I will keep an eye on him and if it seems that he is being bullied or becomes too timid to compete with the others for food, I might have to move him to a different tank. He's the sixth loach and I remember reading somewhere once that it's better to have an odd number of fish in a school. I don't know if that's actually true though! I have a tank with rosy barbs, a few guppies and some rocky cave hardscape for some platydoras to live in which might be a suitable alternative home, although I really don't like the idea of separating him from the others unless I absolutely have to. That is great he is doing better! So, it seems there was something going on that the Kanaplex helped with. I don't think it matters how many fish are in a group, as long as there are enough. There will always be a lower ranking fish, and a larger group can certainly separate into 2 or more groups (or sub-groups) that seem to get along better. This is definitely true of most Loaches, which are not actually schooling, but are social fish. I had a clown that was lethargic, similar to your Yoyo and Prazipro worked wonders. Look it up as another possible course of treatment. Safe for entire tank. Good luck.